Over the past two decades, the capital markets industry has made tremendous efficiency and customer service gains in the front office, but middle- and back-office functions have lagged. High frequency electronic trading still takes days to settle thanks to a long list of complex processes founded on a system of reconciliation. This growing divide has become increasingly untenable for both investment banks and their clients. If there was ever a time for innovation, it’s now. 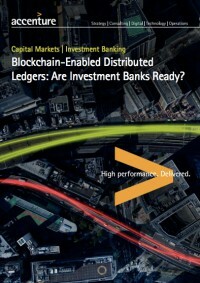 Blockchain-enabled distributed ledgers offer a unique opportunity to fundamentally change how data is managed in investment banking transactions. Instead of each organization maintaining a different copy of the same data set, everyone is given controlled access to a single, shared copy that is continually updated and validated by a network of communicating nodes. Every transaction has a traceable digital fingerprint that leaves an auditable trail. Strong cryptographic techniques use public and private “keys” to ensure confidentiality and privacy. Unlike traditional databases, which are wrapped in a layer of security that, once penetrated, leaves entire datastores vulnerable, blockchain-based solutions provide the ability to encrypt individual transactions or data elements, making it tougher to hack and manipulate. Blockchains work particularly well when there are multiple market participants with multiple data stores that need to be reconciled, when participants require a reliable audit trail and when data security is paramount—making capital markets a natural candidate. 2015 was a year of blockchain exploration, with organizations focused primarily on initial capability and use case assessments, and internal reconciliation. In 2016 and 2017, we expect to see an increase in regulatory certainty as regulators and market participants take a closer look at the required laws, regulations, and processes that will be required for all involved to have the necessary confidence in blockchain systems. That’s going to open the door for early adopters that want to test the technology. Between 2018 and 2024 is when blockchain technology will really take off, with more banks coming on board, more asset classes coming online, new service providers entering the market and new products emerging. By 2025—less than a decade from now—blockchain technology could very well be mainstream. It’s an ambitious timeline, but the appetite for change is there. Next time, we’ll take a closer look at the key benefits and considerations associated with blockchain adoption.